Have you ever looked closely at your windows? We all look through them, but rarely at them and the statement they really can make in any space. Windows are a perfect opportunity to create a wonderful focal point while still being a practical necessity. Choosing the right coverings for any window can be simple once you take into consideration the room's function, the homeowner's needs, style & budget, and the overall décor tone and feel of the room. Spring is a time when we think of freshening up our homes as the weather starts to get warmer and thoughts of winter finally come to an end. 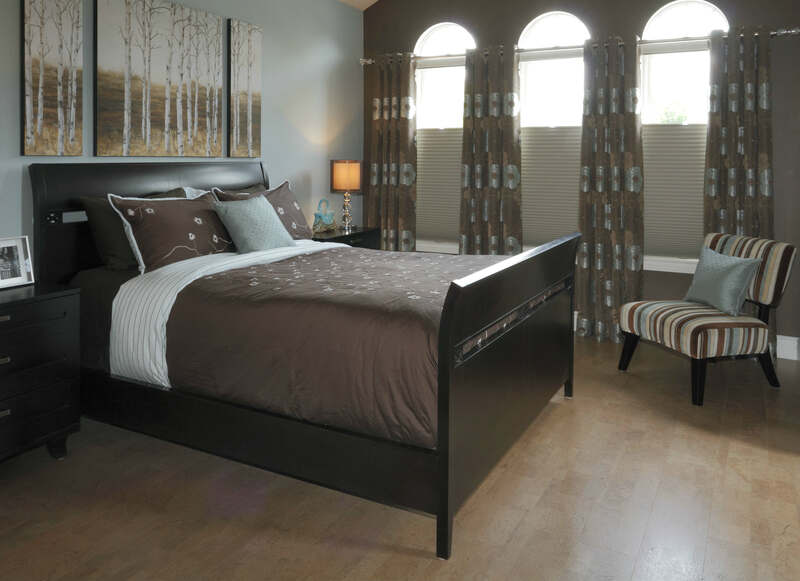 It's a time to look around your home to make each room more a reflection of your style and to update or change the decor without completely redecorating, to give your rooms new life. To find inspiration, you only have to look to things you love, and this holds true to any facet of life, including the decorating of your home. Let that inspiration guide you to the mood and tone you are trying to create in any space. As a decorator, I have done this for others many times and it is the same practice I use in my own home. Most recently, I redecorated the master bedroom and renovated the ensuite bath. In my bedroom, the feel and mood I was looking for was back to nature, organic, and comfort through textures and colour. The main inspirations were a beautiful, canvas artwork series of birch trees and innovative Torlys cork flooring. The artwork provides a tree lined backdrop and mesmerizing focal point that I love. The eco-friendly cork flooring I loved the first time I walked on it barefoot not only for its comfort but the natural beauty and warmth. It is perfect as it creates the imagery of a forest floor for my back to nature theme. Another focal point in the room is the custom drapery that I coordinated with readymade linens for the bed. The floral patterns provided a natural element with the functionality of blackout lining, and complimented the overall colour scheme. It is noteworthy that you can use readymade linens and combine them with custom fabrics for the drapery and accent pillows which can work well together with careful coordination, saving time and money. 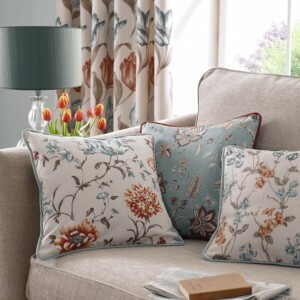 Tip #1 - Add a pop of the seasons trend colour with new accessories such as cushions on a sofa in various shapes, sizes, styles, hang a new print, lampshades, tabletop centerpiece, towels, bedding, storage items or drapery panels. Tip #2 – Get a spring/summer area rug and put the fall one away for a completely new look so you won't have to use the same one all year. Your spring/summer rug can be lighter in tone and in weight as well with spring colours that are neutrals so you can add a new pop of colour each year. Seasonal neutrals include green, blues, whites and yellows. Tip #3 - Paint is the biggest impact for the least amount of money. Paint an accent wall a fresh colour that will make you happy and don't forget to paint your trim and baseboards to freshen them up for a clean new look. Tip #4 - Get planting by bringing plants inside that are various shapes and tones or green and with scent if you like. 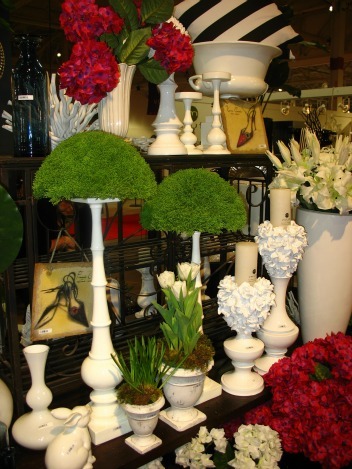 Remember spring is the best time to buy pots to coordinate with your decor for the indoors. Vary the size of pots and heights to create a mini green area or to help fill an empty corner instead of furniture. Cover up the exposed soil with decorative moss or rocks for a finished look. It is also time to prune or get rid of plants that are not full and flourishing as we keep them too long. Tip #5 – In the dining room, on the kitchen island or table add new placemats and dishes using a spring colour with floral napkins of your favorite flower. For a finished look add a beautiful clear, coloured glass or solid white container for fresh fruit and flowers as a centerpiece. With the hustle and bustle of the holiday Christmas season many of us don't have the time to shop around for holiday home décor ideas. Yet, we all want our home to look its best at this time of year. Why not let your trip to Longo's or your grocery store help? 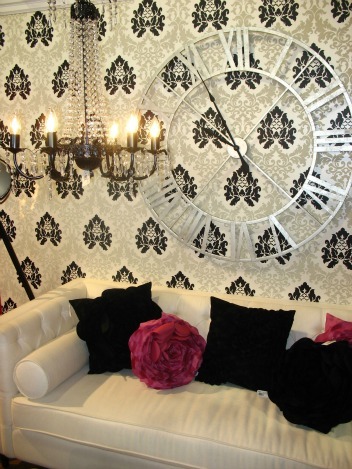 You'll be surprised what beautiful fresh ideas await you to help decorate your home. Get inspired by the rich colours, textures and shapes that you can find in the produce, floral or spice isle. From apples, grapes, cranberries and cinnamon sticks, evergreens and candy you'll find everything you need for unique décor ideas. Not sure where to start? Why not focus on three main areas. Your entrance way, front foyer and dinner /kitchen table top are all key parts of your home that will be seen by the many visitors who will drop by during the festive season. With a few simple ideas you can transform these into beautiful focal points in your home that will leave your guests wondering how you did it all! After you've picked up a few of the items you'll need to add some holiday sparkle to your home, don't forget to pick up something delicious to treat yourself for your efforts and ingenuity. The good news? You can find it all at Longos or your grocery store! The entrance to our homes becomes a busy place this time of year with the comings and goings of family and friends. Warm up your entrance way and welcome your loved ones with a classic urn. An urn of any shape or size can be filled with a number of items including fresh greenery, branches and pine cones that you can easily find in the floral department Don't stop there though, why not add some colour and texture with deep red apples or green artichokes and pomegranates for their unique shape. 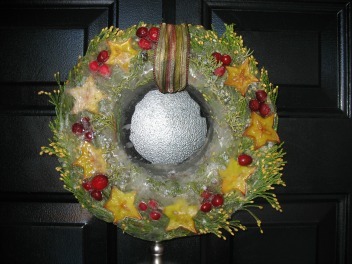 Create a sophisticated ice wreath to adorn your front door using fresh greenery and fruit for colour. Find your inspiration by taking a short tour of the produce department to find the tones that will complement your holiday colour scheme. Why not try a combination of cinnamon sticks, white pine and cranberries? This dramatic, wintery wreath will look terrific on your door during those long winter days when the thermometer drops well below zero. Best of all, it is fun and easy this is to make, so even the kids will love creating their own unique wreaths! There's no denying that the dinner table is one of the busiest places during the holiday season. Make sure you make a statement with a beautiful centerpiece.For an easy and natural festive centerpiece, choose any variety of fruit that is red such as grapes, plums, cranberries or pears. Add sparkle when you "sugar" the fruit by simply brushing each piece with egg white, then dusting with fine granulated sugar. Once the "sugared" fruit have dried, simply arrange them in a favorite bowl or tray and add a touch of greenery like evergreen. Take it a step further and use a hollowed out winter squash in a variety of green hues to hold the sugared fruit!Also remember the tried and true decorations. Oranges pierced with cloves and displayed in beautiful containers provide an easy to make, long lasting centerpiece that also fills your room with a warm, delicious scent. To add height, colour and interest to an area of your home like the foyer inside your front door or beside the fireplace, spear cranberries on dogwood branches at varying intervals and heights. 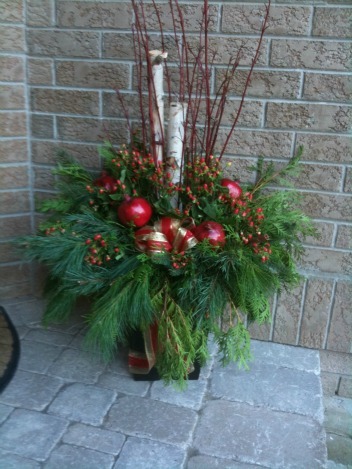 Simply display these cranberry canes into a tall glass vase filled with coarse salt for a simple, elegant wintery look. Include the little ones when decorating for the season. A trip down the candy aisle will provide plenty of ideas to bring out the child in you. Get inspired by classic holiday colours of red, white and green with candy canes and peppermints. Fill a beautiful glass bowl with alternating rows of candy for a simple yet fun centre piece for the "kids table" or place it near the entrance for family and friends to dip into on their way home. Everyone will love your sweet thought! Place a branch in a container filled with sugar or salt "snow", then hang Candy Canes from the branches for a fun display the kids will enjoy. Don't be intimidated by using beautiful fruits, vegetables and dried food items in your holiday decor this season. Let Jackie and Longo's or your grocery store help you be inspired to "freshen up" your holiday décor.